Mt Hood, which boasts Americas only year round snow sports, is suffering. Timberline, which is usually has an open snow park every month except for a brief time of maintenance in the fall has not been open for operation for weeks. The day I took this photo about two weeks ago from just beyond the Timberline parking lot, the mountain itself for the most part was obscured by storm clouds, but you can see the dismal remains of the Palmer snowfield (the snowy "square"), which in the past has normally hosted skiers and snowboarders throughout the entire month of August. The whole of the northwest needs a long fall and winter with a good deal of precipitation. I like the mood of this shot. I'm so sorry to hear this!!! Hoping for adequate snow for you all!!! A beautiful photo nonetheless! Ah, it has indeed been unusually hot here in Oregon, hasn't it!!! It is a terrific capture nonetheless indeed!! Puffy white clouds instead of snow!! Have a lovely weekend!! That is sad the snow is gone, I am sure the snowboarders and skiiers are disappointed. Great sky shot! Have a happy day and weekend ahead! Sigh....I know. Seeing Mt. Hood so barren just makes me sad. Looks like a little field of snow. Such a strange sight on the mountain side. And the cloud patterns hanging round the mountain look quite dramatic. Divine shot at a great angle ~ beautiful sky! Kind of scary... lack of snow probably has an impact on flora and fauna, too. Yes, it is scary! Though do love those clouds. Wishing that better weather will come to your place soon! But I have to say the sky on your shot looks so beautiful! 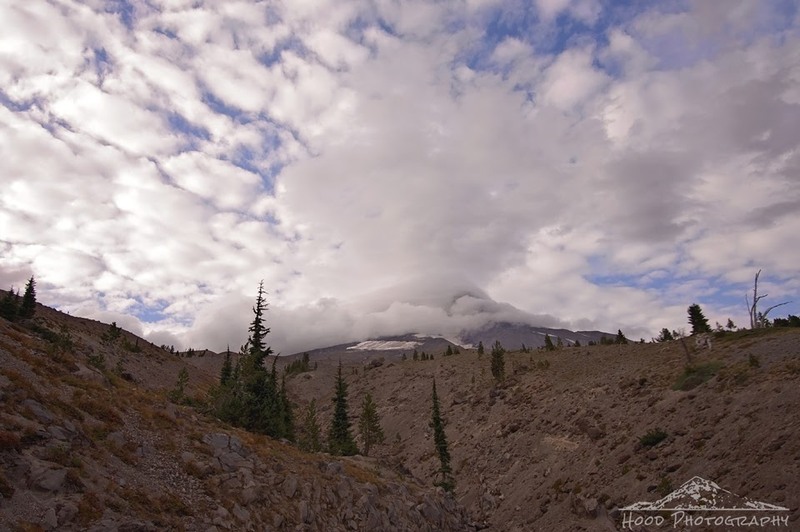 Great shot of the mountain, with neat cloud formations!